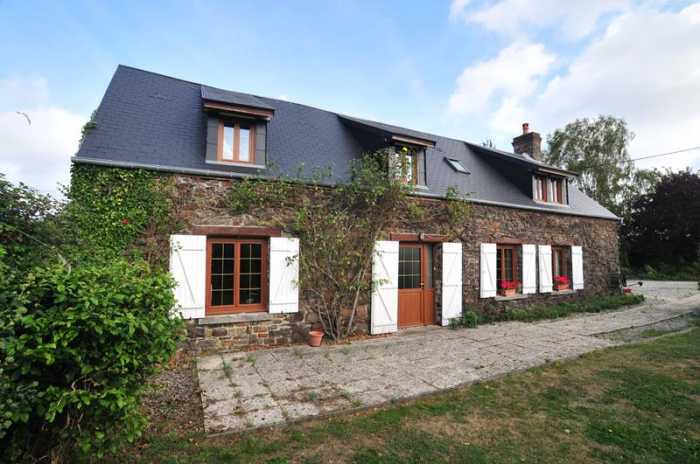 Properties for sale in Normandy, France - AHIN-SP-001096 Putange-Pont-Ecrépin Nr Falaise 61210 Spacious 5 bedroom family house with 5,680m² garden and B&B potential. AHIN-SP-001096 Putange-Pont-Ecrépin Nr Falaise 61210 Spacious 5 bedroom family house with 5,680m² garden and B&B potential. The house has been renovated and extended by the present owners over the last 20 years or so. It now benefits from wood effect double glazed windows with wood shutters on the ground floor which were fitted 8 years ago and a garage extention with 2 bedrooms and bathroom over it which was buit in 2005. The roof of the main house was replaced ion 2016 and a new gas fired condensing boiler was installed 10 years ago. Viewing is recommended. The property is set at the southern end of Swiss Normandy; an area of outstanding natural beauty and a popular tourist destination. Travel from the port of Caen (Ouistreham) to the property is a mere 55 minutes. Paris is only 2 hours to the east and the lovely old town of Bayeux and the Normandy beaches are just an hour to the north. It is also en route south (A88) for Le Mans, Tours and the South of France, with Brittany just a couple of hours away to the west. The nearest town is Falaise, which is the ancestral home of William the Conqueror. Nearby is a large lake through which flows the River Orne. The lake is used, amongst other things, for water-skiing, canoeing and fishing and there is a choice of two restaurants on the lakeside. The property is well served by local shops and restaurants at Putange-Pont-Ecrépin just 5 minutes drive away. Within a few minutes' drive is Falaise and Clécy in the heart of the area known as Swiss Normandy. The D-Day landing beaches are within an hour's drive. Entrance Hall Partly glazed door and side panel to front (south) elevation. Telephone sockets. Tiled floor. Radiator. Elm stairs to first floor with cupboard under. Cloakroom Tiled floor. Toilet. Hand basin. Lounge/Dining Room 7.10 x 5.52m 2 windows to front and partly glazed door to rear elevations opening on to patio and pergola. 3 radiators. Tiled floor. Exposed beams. Granite fireplace with wood-burner. Built-in shelves. Boiler Room 3.97 x 1.80m Wall mounted boiler (serviced every year). Door and window to east elevation. Tiled floor. Exposed stone wall. Landing Part wood and part laminate flooring. En-Suite Shower Room 3.23 x 1.35m Velux window to front elevation. Shower. Vanity unit. WC. Radiator and heated towel rail. Sloping ceiling. Bedroom 2/Study 3.16 x 1.66m Sloping ceiling. Velux window to rear elevation. Radiator. Bathroom 2.86 x 12.29m Window to front elevation. WC. Bidet. Pedestal basin. Radiator. Wood flooring. Bath with mixer tap/shower fitment, tiled surround and screen. Bedroom 3 5.00 x 2.74m Window to front elevation. Radiator. Wood flooring. En-Suite Shower Room 2.49 x 1.22m Velux window to west elevation. Tiled floor and walls. Sloping ceiling. Pedestal basin. WC. Heated towel rail. Shower. Bedroom 5 4.13 x 3.89m Laminate flooring. Window to east elevation. Radiator. Double wooden gates lead to gravel drive, parking and turning area and integral Garage 6.15 x 5.95m Electric up and over door. The garden is laid to lawn with mature hedges and trees, flower borders and patio area with perola. Wooden garden shed with Fibro-ardoise roof at present used as wood shed. Part concrete floor. Mains water, telephone and electricity are connected. Gas fired central heating. Broadband internet connection available. Drainage in the main house is to an all water septic tank. Well water with submersible pump used for garden.